Intel's 8-core Mainstream Coffee Lake-S Processor Spotted in the Wild? A screenshot of what seems to be a higher core-count CPU from Intel has been doing the rounds, brought to us by the usual suspects. This supposedly marks the first appearance of Intel's new Coffee Lake-S processors, which should feature increased core-counts - gearing them towards stealing some of AMD's initiative. If you'll remember, the red team regained it in explosive fashion with their first generation Ryzen CPUs - and AMD is looking to double down on with the launch of their updated, 12 nm refresh Ryzen 2000 series just next month. The new CPUs should be delivered alongside a new platform, Z390 - at the moment, a mirage that's been referenced here and there, but still has no concrete evidence towards its existence. 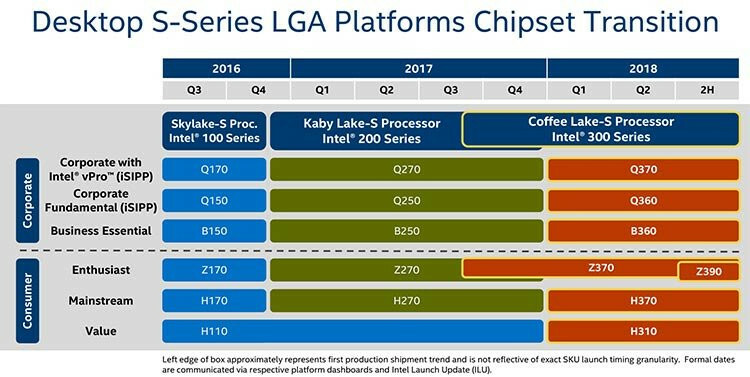 However, it's expected that Z390 as a platform will be what Intel's Z370 was supposed to be from the very beginning - but never could. The idea that's been circulating, and which has some credit (though it should still be taken with a salty disposition), is that due to Intel's need to rush Coffee Lake out the door - so as not to compete against AMD's 8-core Zen-based CPUs with their usual cadre of 4-core, 8-thread processors - led the company to rush out the Z370 release. The idea for Z370 was simply for it to deliver, at all points in the minimum requirements, the correct power delivery hardware and mechanisms for the increased power draw that comes with the added cores. But it was, as such, absent of any real improvements - it can be interpreted, basically, as a re-branded Z270 chipset platform - and there's something to that claim, definitely. Thus Z390 will be the actual, originally planned platform for Intel's Coffee Lake CPUs, with all features - however fair that is for buyers of Intel's Z370. 33 Comments on Intel's 8-core Mainstream Coffee Lake-S Processor Spotted in the Wild? Good to see it too eh. I do love the slide though ,the truth obfuscated by making the right square smaller , instead of the left. ....what will the hedt processors have left to offer? 0nm manufacturing process? 2 208 stock clock and 2 208 turbo clock? We already knew it would have 8 physical/16 logical cores, and Z390 chipset, months ago (Nov. 2017). There is no new information here, just a friendly reminder of what's coming (we still don't know when). Thanks anyway for this, Mr Raevenlord, I like to hear any news related to the ongoing rivalry/drama between red and blue. Hopefully the next news flash will tell us what the clocks will be set at, or maybe a faster stock RAM speed. 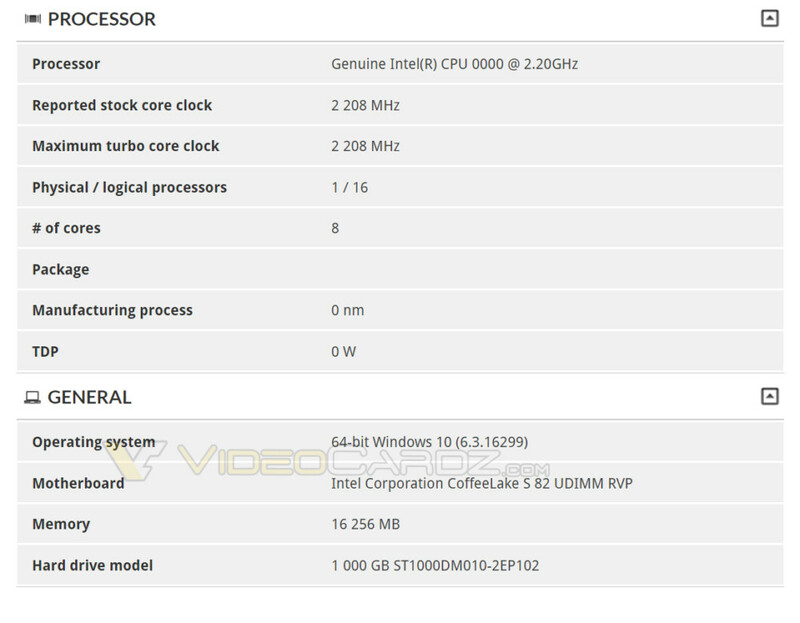 Will we see an 8 core i5? Maybe in another 5 years. i3s just made it to quad core status so dont sh!t on their parade just yet. Not really - you have 12 logical cores, which no i5 has (yet). 4.5 GHz isn't that bad, either. You're still good for a couple of years, anyway. tests show that 6 cores 6 threads beats 4 cores 8 threads in every test even thread intensive ones, isnt that crazy? i wish i could site the source but a tpu member did it here and proved that the real cores beat out the threads needed on lesser cores. That's not crazy it's basic logic...hyperthreads boost multi-threaded results over just cores by <20% typically. Unless customer is willing to spend more than 1000$ there are very little benefits to going for Intel's castrated HEDT platform. For majority of consumer applications Quad channel memory is hardly useful. Also dont forget you need to spend 100$ or so if you want to do a NVME RAID which is even worse restriction than having limited PCI-E lanes on sub $1000 CPUs. 2.2Ghz? What's this, a 32 Core CPU?? No, it's an early ES, they often run at super low clocks, helps prevent theft and resale and ensures stability. Engineering Sample..? And I guess that softwares doesn't recognize these yet. Only test that I know it won't beat that is Crysis 3: when one is watching to large areas. But yeah 6 physical cores > 4 cores and 8 threads. Some games might even work better with 4 cores enabled and hyperthreading disabled. 8600K does not crush 6700K at all. They are pretty even. Depends on workload/game. In most games 6700K/7700K/8600K/8700K performs almost identical at same clocks. I’m sure Intel has test and validated that pigeon poop for the use cases of their processors :p.
Throttling is happening even on stock CPU's. K models are "OC versions" after all. Altho delid is needed to OC properly. Most of them can't even hit 5 GHz stable without throttling. Intel sent out review samples that overclocked better than average and even these hits 90C+ at 5 GHz using 240-360mm AIOs. No it does not. Haha. Especially not in games. It's the exact same arch with 2 more cores and no HT. At stock 7700K beats 8700K in many games too (higher boost/clocks on the quad). Most games are still 2-4C. Very few can use more than 4C and those who can, can use HT for same perf. BF1 is a prime example. 6700K has higher minimums than 8600K. The 6 cores are maxed out. No HT to help. Look back and see how silly 6600K/7600K does in games. It's only a matter of time before 8600K will fall short. That's not what testing has found out. HardOCP has tried delidding and they got like 100MHz more. To me, that's proof the stock solution is more than adequate. And no, they don't throttle by default. They may not sustain boost clocks indefinitely, but they will sustain the advertised base clocks.